May 2013, bloated stomach – diagnosed as gastric problem. Gastric drugs did not cure. Consulted specialist in a hospital in Jakarta. Diagnosed as leukemia. Came to Penang, Malaysia – bone marrow biopsy, confirmed Leukemia – AML. Had chemotherapy – 6 cycles, from June 2013 until February 2014. Blood tests on February 11, 2014, fine. Follow up after 3 months, May 6, 2014, Recurrence, extremely low platelets, only 4. The doctor said chemo again, try 2 cycles first. Need to pay RM 50,000. 1. Can chemotherapy cure you? 2. What is the total cost of the chemo treatment? 3. How long would you have to undergo chemotherapy? (Thank you KM for this contribution). The day that changed the lives of my wife and I came on one Sunday in October 1998. I had just returned from an overseas trip that Sunday, arriving home in the afternoon. That morning, my wife had brought our eldest son, KW to a private hospital to do some test to see why his mild fever did not go away. She returned late that afternoon without our son. The expression on her face told me that something very serious had happened. With tears in her eyes she told me that our son, KW had leukemia. We went to the hospital later in the evening. KW was quite calm but he did asked “why me?” I think no one can answer that question. In this world there are smokers who do not get lung diseases. And there are non-smokers who end with having lung cancer for example. Some of KW’s close friends also visited him. KW was then 25 years old. He had returned earlier that year from Australia after graduating with an Electrical Engineering degree. He found a challenging job with a world-renowned American IT multi-national company soon after. (We were told later by his superior that he had received commendations during his short time with this company). My wife and I were very happy then seeing our eldest son had started his career while our younger son was still studying in the UK. But this was to be the beginning of our sufferings with our eldest son. After consultation with some friends who had connections in the medical field, we transferred KW to the Singapore General Hospital. That was the start of his ten-month stay in hospital with very short spells of home stay. That was also the beginning of ten months of suffering for KW from the side effects of chemotherapy, radiotherapy and finally the bone marrow transplantation. I was then working for an understanding European company in a regional capacity which allowed me to have time with our son daily except when I had to travel. During work I was able to get away from the heavy heart we experienced when with KW. But it was not the case for my wife who patiently spent some ten to twelve hours each day to be with our son. Yes, daily for ten months. My wife saw and experienced firsthand all the sufferings endured by our eldest son. Chinese New Year was spent in Singapore General Hospital together with KW. During the later part of the 10 months, I and my younger son (who was back from study break) took turn to spend the night with him. It was on a day during the last month (July 1999) of our son’s suffering that my wife was traumatised badly seeing the hospital medical personnel giving medical treatment to our son without telling her what happened even when he went into induced coma and had to be put in the intensive care unit. During our visits when he was in intensive care, we noticed tears in KW’s eyes when we talk to him. We knew he could hear us. Days later our younger son answered a telephone call at around 11pm asking us to go to the hospital. We reached the hospital just before midnight and rushed to the intensive care unit but were not allowed to see KW as the doctors there were trying to revive him. Minutes later, the doctors came out of the intensive care unit to tell us the bad news. All three of us, me, my wife and our younger son cried quietly when we went in to see him. We were calm and we accepted the ending. THE HEAVY LOAD ON OUR SHOULDERS FINALLY WAS NOT THERE ANYMORE. In the course of those ten months, my wife and I learnt meditation and we became spiritual rather than religious. We learnt meditation, life and death including life after death from an ex-medical doctor. We found comfort here. It was with all these that we were able to face the situation better. We have learnt a lot during those ten months about human relationship, compassion, caring, etc. My wife and I also learnt that whilst we grieve we cannot do so for eternity; we have to let go and live our own lives. We accepted our physical connections and relationship with KM has ended. We know spiritually he will always be with us. He, like all human beings was born into this earth to learn, to experience, and came for a single or multiple purposes. As soon as these purposes are fulfilled one leaves the earth by passing on. But their spirit will always be around. KW died in August 1999. The followings were events and happenings witnessed by our family after his passing on. To the unbeliever these were imaginations or hoax. But my wife, our younger son and I all believed that KW visited us and leave behind telltale signs to tell us of his presence. Our family is very close to each other. We were not afraid at all. Two days after KW’s death, we got a call from our tenant (we leased out our house and were living in an apartment), that the mirror of one of the bathrooms cracked and shattered. When my wife (still in mourning) went to our house to investigate with the glazier who installed the mirror, she found it was the bathroom that used to be KW’s. The glazier was surprised the mirror cracked as he had not seen such crack before. We believe KW who loved the house very much visited his favourite residence (his mother had promised him that when he gets well we would move back). One day about a month later, the ceiling fan in the living room of our apartment was spinning faster than the set speed and I told my wife that perhaps the fan control was faulty. Two days later, it happened again. Being spiritual and having learnt about life and death and life after death, my wife asked whether it was our eldest son visiting us and the reply came with the ceiling light switching on by itself. My wife asked whether he is happy over there and to confirm it. Again, confirmation came with a light switching off by itself. Some days later, when I walked towards the balcony of the apartment where we lived at that time, the balcony light came on by itself. Our younger son returned to the UK in September about a month after the passing of his brother to continue with his studies. In December of that year I asked that he come back to Singapore for the Christmas and New Year break to spend time with his mother. On the second day of his return, I was with him in our living room, with me watching TV and him lying on the sofa. Suddenly he called out to me to look at the ceiling fan which surprisingly was spinning very fast although it was set at low speed. Some days later whilst working on the computer near the dining room late one night, he heard a click and the light on the ceiling fan came on. Again similar things like ceiling fan running faster, light switching on and off happened to our younger son when he came back to Singapore again in March and in June of 2000. We all knew KW came back to see his brother. Around the middle of 2000 my wife who is short sighted saw the image of KW when she got up from bed one morning. Without her eye glasses, she could see clearly an image of him showing him around 15/16 years old with beige colour shirt and long pants appearing happy. His appearance lasted only seconds. He had come to say goodbye. This was to be his last presence as from that day onwards there were no more appearance, no ceiling fan running at fast speed, and no switching on or off of lights. We believed that it was time for his soul to move on. My wife and I were happy to know that our eldest son is happy over the other side. We continue to believe that he is happy and that his soul lives on, on the other side. We believe it is difficult for spirit to manifest itself in the form of human. The vibration of spirits is very high so we cannot see them easily. To illustrate let me explain this in a simple way. When a table or standing fan with its three blades stationary, can we see through the blades? The answer is no we cannot. But if we switch on the fan at low speed we can vaguely see through them and when the fan is at high speed we can definitely see through the blades. So spirits being high in vibration cannot be seen by us although they are present; we are seeing through them. Two years after KW’s death, my wife had breast cancer. She refused to receive any conventional medical treatment such as chemotherapy, radiation, etc., relying on food and food supplements. She believes her condition was brought about by the emotional stress and trauma experienced during those ten months when KW was in hospital. For the past six years she was living a “normal healthy life”. On 10 January 2008, she complained of severe pain below her shoulder blades. She could not get up after lying down in bed. Any body movement caused severe pain. The next day, the neighbourhood doctor had to make a house call and prescribed some pain killers. She had read about Dr. Chris Teo, in a book by Betty Khoo called “Cancer Cured Naturally”. She decided to consult Dr. Teo in Penang. But before the trip, I made her to see a pain specialist to address the pain problem so that she can comfortably travel to Penang. We contacted Dr. Teo who asked for a full blood test to be done so that he can be aware of my wife’s condition and not doing things blindly. The blood test showed the breast cancer had probably metastasised to the bone. Her liver functions were also not good including presence of some forms of inflammation. We went to Penang to see Dr. Teo a week later. Dr Teo prescribed the required herbs and advised what food she can and cannot take. After taking the herbs for two weeks she was completely off pain killers and she could lay down more inclined. After four weeks of taking the herbs, she was able to sleep flat in bed and get up without pain except some pressure at the sternum. She still experienced “ache” around her shoulder blades but not those severe pain. Her energy level was higher and she can raise and stretch both her arms more easily now. She believes the herbs are definitely helping her and improving her condition. Meanwhile, my wife had PET/CT scan done on the advice of Dr. Teo and the results confirmed the breast cancer had metastasized to her spine, hips and lungs. She continues taking the herbs consciously and is extremely careful and mindful of what she consumes as drinks and food. She now thinks that perhaps had she handled her emotion better, letting go and accept the fact that loved ones can be lost, she might not be in the condition she is now in. Both my wife and I now live for the present and not worrying what can happen. We are taking one step at a time. We are also grateful to Dr. Chris Teo and his wife for helping and guiding us through. We have faith in them and are hopeful my wife will be cured. Comments: This is the advice we give to those who come and see us. Learn to let go. When you hate, the only person who gets hurt is you. Because those people whom you hate don’t know; And the rest of the world, don’t care a damn! Is Chasing Away Evil Spirit As Good As Taking Chemo-drug? Lina (not real name) is a 36-year old female. She was diagnosed with CML (chronic myeloid leukemia) in August 2008. The doctor at the Singapore General Hospital prescribed an oral chemo – Glevec (Imatinib) – for her condition. This medication cost S$3,500 per month. Initially Gleevec was good for her but after 6 months she suffered a relapse. The consumption of Gleveec was stopped. The doctor suggested Lina undergoes a bone marrow transplantation. This procedure would cost approximately S$50,000 to S$100,000. Lina declined. She said: I would rather die than undergoing this procedure and go bald. In view of this, the doctor prescribed Lina another oral drug, Dasatinib (or Sprycel) at 140 mg /day. This medication costs S$6,000 per month. After taking this drug for the past few weeks, Lina suffered pains in her bones – the pains seemed to move around the whole body. Desperate in wanting to find a cure for her illness, Lina went to seek the help of a medium who lives in private house somewhere in Singapore. The medium told Lina that her problem is a result of evil spirits. He (the medium) would be able to chant and pray to get rid of these evil sprits, but this comes with a price tag of S$3,800. The medium told Lina that after one chanting, she will be cured. Lina wanted to try this treatment but her husband objected. 1. Desperate people will do desperate things to find a cure that rarely exist. 2. Desperate people are vulnerable. 3. There are enough vultures around ever ready to pounce of such desperate people. They come as Black Crows or Men-in-their-white-coats. Therefore it is up to us to be on the watch out and empower ourselves to look out for such people. There are still people who want us to believe that diseases are due to evil spirits or even as God’s punishment for our sins. As such chanting, prayers and ritual cleansing can do the job perfectly well. My reading tells me that some diseases can indeed be due to the mind and has no organic origin. In such cases, practices that unblock the mind and restore our positive emotion may help. However, if the disease is of organic origin, i.e., due defects of basic biochemical processes or tumours, it is indeed hard to believe that only chanting, prayers, ritual cleansing or drinking of blessed plain water can cure the problem. However, desperate people are vulnerable! The main concern of such spiritual treatment is how it affects the patient. In this case, the worst that can happen is that Lina would be poorer by S$3,800 if her leukemia is not cured. There is no other harm. Lina had already spent S$3,500 per month for 6 months (total S$ 21,000 for the so called scientific medicine, Gleevec) and she ended up with nothing as well. If we look at it from this viewpoint, the taking of the so called scientifically proven drug is no better than paying the medium. In fact the medium asked for much less money. We can’t blame Lina if she chooses to believe in the medium. She has put her full trust in her doctor and medicine had failed her. So what is the difference then – medium or doctor? Now, Lina is on another drug that costs S$6,000 per month and she ended up with unexplained pains that moved around her body. What is going on? I thought the medium ought to be a bit more clever – why offer just a chanting service? In addition to chanting, dish out some coloured sugar pills for her to swallow each day. Tell her the pills are going to cure her, besides the sms he (the medium) is sending to the devils. Look at it this way, is the result that Lina had thus far, not about equivalent to what she had obtained by paying the hospital – S$3,500 or S$6,000 per month? And I am also sure that those coloured sugar pills (if the medium where to dish out) will not cause pains. Gleevec, also known amatinib, is a new drug that was approved by the Food and Drug Administration for the treatment of chronic myeloid leukemia (CML), a cancer of white blood cells, and for the treatment of a rare form of stomach cancer called gastrointestinal stromal tumor (GIST). One study had shown that in 9 of the 20 patients who were treated for five months or longer, no leukemia cells could be found, which showed that the drug was eliminating the source of the cancer. Another research paper said: imatinib has had a marked impact on outcomes in patients with CML. It remains a valuable treatment for all stages of the disease. The truth is: As far as Lina is concerned Gleevec has failed her. Why? Perhaps she is the unlucky one or perhaps the devils are still around? What is Sprycel or Dasanib? 1) Can cause low red blood cell counts (anemia), low white blood cell counts (neutropenia), and low platelet counts (thrombocytopenia). 2) Can cause bleeding. The most serious is bleeding in the brain leading to death, and bleeding from the gastrointestinal tract. Less severe events included bleeding from the nose, the gums, bruising of the skin, and excessive menstrual bleeding. 3) Can cause fluid to accumulate in the legs and around the eyes. In more severe cases, fluid may accumulate in the lining of the lungs, the sac around your heart, or abdominal cavity. 4) Other side effects are diarrhea, skin rash, headache, fatigue, nausea, muscle and bone pain, fatigue, fever, cough, poor appetite, dizziness, moth sore, constipation, chest pain, numbness and tingling in hands and feet, chills, weight gain, etc. After knowing the possible side effects of the new S$6,000-month-drug, I developed cold feet. My feet get even colder when I recall what happened to KW, a 25-year electrical engineer. He was diagnosed with leukemia and underwent medical treatment, including bone marrow transplantation. He died within 10 months. (Read Story 3: War Against Leukemia: The Story of Our Eldest Son). Perhaps Lina should just opt to have the medium chase away the devils instead? At least, she would suffer no harm. If the medium could keep the devils away for 10 months, then the treatment is a real bargain. Either way, no one seems to be right and sure, at this point in time. The medium is selling hope but he does it in a crude way. Not many would believe his stunt and most regard it as a con job. Doctors too are selling hope and they do it in a scientific way. The entire world tends to believe them. In the end, it is all about perception! Either way the result may just end up the same? Note: By writing this case, I am not implying that you go to the medium for treatment. Going to the medium probably has similar effect as wait and see or do nothing is better than doing something aggressive and deadly. In this case Lina came to us for herbs. In leukemia patients, the normal development of the blood cells is disrupted and they are being crowded out by abnormal, immature blood cells. The full blood picture (FBC) of such patient shows abnormal blood counts. The patient is anemic with low red blood cells, haemoglobin, and platelet counts. The white blood cell may be high or low but there is usually neutropenia (low number of neutrophils). Lactic dehydrogenase (LDH) level is usually raised. Hyperparathyroidism (overactivity of the parathyroid glands resulting in excess production of parathyroid hormone). Bone pain which may result in a limp, refusal to walk or localized discomfort of the jaw, long bones, vertebral column, hip, scapula and ribs. Swelling of the liver, spleen and lymph nodes. Hepato-splenomegaly occurs in approximately two thirds of patients with ALL. About fifty percent of patients showed asymptomatic lymphadenopathy. Paratracheal or mediastinal adenopathy and thymus enlargement may result in mild to severe respiratory symptoms. Nephritis (kidney inflammation). Renal involvement by ALL can result in hematuria (blood in urine), hypertension and renal failure associated with nephromegaly. Meningitis (inflammation of the protective membranes covering the brain and spinal cord). Meningeal involvement can result in severe headache, emesis (vomiting) and papilledema (optic disc swelling caused by increased intracranial pressure). Less than 5 percent of children have evidence of CNS 2 at diagnosis (CNS 2 means less than 5 WBCs/ul but blasts are present). Unless adequate CNS preventive therapy is administered the majority of patients will eventually develop CNS disease. CNS leukemia is presumed to develop either from the spreading or seeding of the meninges (membranes enveloping the central nervous system) by circulating leukemic cells or by direct extension from involved cranial bone marrow. Clinically evident testicular involvement is rare at initial diagnosis but overt disease occurs in approximately 10 to 15 percent of boys with ALL. Clinically overt, testicular leukemia presents as painless testicular enlargement that is usually unilateral. Although it is believed that the testes are a leukemic sanctuary site, protected from systemic chemotherapy by a blood-testes barrier, animal studies suggest this is not the case. Nodal involvement is a characteristic feature of ALL and is often responsible for bringing the patient to medical attention. Typically the lymphadenopathy is generalized and enlarged nodes are painless and freely moveable. Nodal enlargement is an indirect measure of tumour burden and has been associated with prognosis. Morphologic and laboratory assessment of peripheral blood and bone marrow, blood chemisty, comprehensive clotting studies, a lumbar puncture and CSF (cerebrospinal fluid) examinations. The diagnosis of acute leukemia entails a stepwise approach. First in sequence and importance is the distinction of acute leukemia from other neoplastic diseases and reactive disorders. Second is differentiating acute myeloid (AML) and acute lymphoblastic (ALL) leukemia. The third facet is the classification of AML and ALL into categories that define treatment and prognostic groups. Approximately 80% of cases of ALL have a B-cell precursor immunophenotype. Approximately 15% of ALLs have an antigen profile of T-cell precursors (thymic T cells). A small group of cases (<5%) of ALL have the immunophenotypic profile of more mature B cells, i.e., surface immunoglobulin. Ethnicity: Caucasians are more likely to develop acute leukemia than African-Americans, Asians or Hispanics. However, they also tend to have a better prognosis than non-Caucasians. Age at diagnosis: children between 1–10 years of age are most likely to develop ALL and to be cured of it. Cases in older patients are more likely to result from chromosomal abnormalities (e.g., the Philadelphia chromosome) that make treatment more difficult and prognoses poorer. Cancer spread into the Central nervous system (brain or spinal cord) has worse outcomes. Morphological, immunological, and genetic subtypes. Patient’s response to initial treatment. Until recently, the diagnosis and classification of acute myeloid (AML) and acute lymphoblastic (ALL) leukemias was based almost exclusively on well-defined morphologic criteria and cytochemical stains. Although most cases can be diagnosed by these methods, there is only modest correlation between morphologic categories and treatment responsiveness and prognosis. The expansion of therapeutic options and improvement in remission induction and disease-free survival for both AML and ALL have stimulated emphasis on defining good and poor treatment response groups. This is most effectively accomplished by a multifaceted approach to diagnosis and classification using immunophenotyping, cytogenetics, and molecular analysis in addition to the traditional methods. Immunophenotyping is important in characterizing morphologically poorly differentiated acute leukemias and in defining prognostic categories of ALL. Cytogenetic and molecular studies provide important prognostic information and are becoming vitally important in determining the appropriate treatment protocol. With optimal application of these techniques in the diagnosis of acute leukemias, treatment strategies can be more specifically directed and new therapeutic approaches can be evaluated more effectively. A translocation between chromosomes 9 and 22, known as the Philadelphia chromosome, occurs in about 20% of adult and 5% in pediatric cases of ALL. Not all translocations of chromosomes carry a poorer prognosis. Some translocations are relatively favorable. For example, Hyperdiploidy (>50 chromosomes) is a good prognostic factor. B-cell precursor ALLs have a more favorable prognosis than the other groups; however, within the B-cell precursor category, there are subsets with a poor prognosis. Most of the favorable and unfavorable prognostic groups of B-cell precursor ALL can be identified by their cytogenetic karyotype or molecular features. Nearly 30 years ago, Dr. Donald Pinkel developed the concept of total therapy and demonstrated that childhood leukemia could not only be cured but CURED in approximately half of the patients. But note that acute leukemia in children is very different from the adult version of the disease. Administration of different sets of drugs for induction and continuation of remission. Intensive antimetabolites and alkylating agent treatment immediately after remission induction. Cessation of all therapy after 2 to 3 years of continuous complete remission. One of the most remarkable occurrences in the history of ALL therapy is the fact that there have been NO new agents introduced in the front-line therapy of ALL for the past 25 years. The same eight types of agents have been used in newly diagnosed patients since the early 1970s. A corticosteroid (prednisone, prednisolone or dexamethasone). Asparaginase (four types are currently available). An antipurine (6-mercaptopurin or 6-thioguanine). Four main treatment phase or blocks are adopted by various treatment centres or international co-operative groups in their treatment protocols for ALL. REMISSION INDUCTION PHASE: The goal of this phase is to kill the leukemia cells in the blood and bone marrow. The treatment comprises a backbone of three systemic agents: a glucocorticoid, vincristine and L-asparaginase for standard-risk cases. Many treatment protocols add a fourth agent such as an anthracycline for high-risk cases. The treatment is delivered over 4 to 5 weeks with the goal of achieving complete remission – meaning that leukemia cells are no longer found in bone marrow samples and the blood counts become normal. A bone marrow test is taken at the end of induction treatment to confirm whether or not there is still has leukemia. The bone marrow sample is looked at under a microscope. But take note that a remission is not the same as a cure. More than 95% of children with ALL will go into remission after one month of treatment. A rapid early response to treatment, measured by the clearance of blasts from either the bone marrow or peripheral blood, has been shown to predict better treatment outcome. Anticancer drugs given by mouth or injected into a vein to kill leukemia cells may not reach leukemia cells in the CNS (brain and spinal cord). The leukemia cells are believed to have the ability to find sanctuary (hide) in the CNS. CNS sanctuary therapy is also called CNS prophylaxis because it is given to stop leukemia cells from growing in the CNS. All children with ALL receive CNS sanctuary therapy as part of their treatment and may start simultaneously with the remission induction therapy phase. CNS treatment involves injecting a drug, usually methotrexate, directly into the spinal fluid. This procedure is referred to as intrathecal chemotherapy and is done during a lumbar puncture. Some patients who have a relapse in which leukemia cells are found in one part of the body (such as the cerebrospinal fluid or the testicles) but are not found in the bone marrow. These children may have intense chemotherapy, sometimes along with radiation treatment to the affected area. Radiotherapy to their brain (cranial radiotherapy) is not done if the patient is younger than two years old. Those with T-cell leukemia or cancer cells in the CSF, may need radiation to the head, too. But recent studies have found that many children even with high-risk ALL may not need radiation therapy if they are given more intense chemo. Doctors try to avoid radiation because, no matter how low the dose, it may cause some problems in thinking and growth. CONSOLIDATION or INTENSIFICATION PHASE: Studies from the German BFM (Berline-Frankfurt-Munster) group have shown that the use of drugs such as cyclosphamide, cytarabine, and thioguanine in combination may further reduce the levels of sub-microscopic residual ALL cells. However, this treatment may lead to substantial toxicities and complications, but the cure rate increase far outweighs these risks. These treatments may be given immediately after remission has been achieved or they may be given later such as between 4 to 6 months after remission – this phase is known delayed intensification. In high-risk patients, repeated delivery of intensive blocks of chemotherapy courses interspersed by relatively non-myeloablative interim maintenance chemotherapy has improved cure rate substantially. The epipodophyllotoxins, such as VP-16, are potent anti-leukemia agents, but its use is often restricted in childhood ALL because of is potential for contributing to the secondary development of AML. But in high-risk patients, its use is currently justified. The goal of this intensification phase is to get rid of any remaining leukemia cells that may not be active but could begin to regrow and cause a relapse. This phase lasts about one to two months. Several drugs are used, depending on the child’s risk category. Some children may benefit from a stem cell transplant at this time. MAINTENANCE PHASE: If the leukemia stays in remission after the first two phases of treatment, this last phase, maintenance chemotherapy begins. The total length of therapy for all third phases is two to three years for most children with ALL. The purpose of this third phase of treatment is to kill any remaining leukemia cells that may regrow and cause a relapse. Often the cancer treatments in this phase are given in lower doses than those used for induction and consolidation phases. Weekly oral doses of methotrexate. Every four weeks, pulses of intravenous vincristine combined with 5 days of oral glucocorticoid. Patients will be able to take part in their normal daily activities for as long as they feel able to. Most children return to school before beginning maintenance treatment. This phase of treatment lasts for up to two years from diagnosis for girls and up to three years for boys. This is because boys are at higher risk for relapse than girls. The few attempts to reduce the duration of treatment protocols to less than 2 years from remission have been associated with increased risk of relapse. Likewise, there appears to be little benefit to extending the duration of maintenance therapy beyond 3 years. In some situations it may be necessary for boys to have radiotherapy to their testicles. This is because leukemia cells can survive in the testicles despite chemotherapy. Bone marrow contains immature cells known as hematopoietic stem cells which divide to form more blood-forming stem cells, or they mature into one of three types of blood cells: white blood cells, red blood cells and platelets. Most hematopoietic stem cells are found in the bone marrow, but some cells, called peripheral blood stem cells (PBSCs), are found in the bloodstream. Blood in the umbilical cord also contains hematopoietic stem cells. Cells from any of these sources can be used in transplants. In autologous transplantation, patients receive their own stem cells. In syngeneic transplantation , patients receive stem cells from their identical twin. In allogeneic transplantation, patients receive stem cells from their brother, sister, or parent. A person who is not related to the patient (an unrelated donor) also may be used. To minimize potential side effects, the stem cells must match the patient’s own stem cells as closely as possible. A special blood test is done comparing the human leukocyte-associated (HLA) antigens on the surface of the cells. In general, patients are less likely to develop a complication known as graft-versus-host disease (GVHD) if the stem cells of the donor and patient are closely matched. High-dose chemotherapy is given before stem cell transplantation, i.e. giving high doses of anti-cancer drugs to kill cancer cells. This treatment often causes the bone marrow to stop making blood cells and can cause other serious side effects. After being treated with high-dose anticancer drugs and/or radiation, the patient receives the stem cells through an intravenous (IV) line just like a blood transfusion. This procedure takes one to five hours. After entering the bloodstream, the stem cells travel to the bone marrow, where they begin to produce new white blood cells, red blood cells, and platelets in a process known as “engraftment.” Engraftment usually occurs within about 2 to 4 weeks after transplantation. Doctors monitor it by checking blood counts on a frequent basis. Complete recovery of immune function takes much longer, however—up to several months for autologous transplant recipients and one to two years for patients receiving allogeneic transplants. Doctors evaluate the results of various blood tests to confirm that new blood cells are being produced and that the cancer has not returned. Bone marrow aspiration (the removal of a small sample of bone marrow through a needle for examination under a microscope) can also help doctors determine how well the new marrow is working. In the initial 2 to 4 weeks after transplantation, the patient’s immune system is not effective and is easily susceptible to infections. Hence, utmost care is required to maintain a sterile environment. The patient is put on antibiotics and other medications to protect against viral and fungal infections. After this period, the graft begins to settle in the new bone marrow, produces blood cells and gradually improves the host’s condition. Drugs to suppress immunity may be withdrawn once the graft has taken hold in the recipient. Most patients may need re-immunization with vaccines at this stage. Note: Besides leukemia, stem cell transplantation is used to treat lymphoma, multiple myeloma and myelodysplasia. The major risk is an increased susceptibility to infection and bleeding as a result of the high-dose cancer treatment. Doctors may give the patient antibiotics to prevent or treat infection. They may also give the patient transfusions of platelets to prevent bleeding and red blood cells to treat anemia. Patients who undergo BMT and PBSCT may experience short-term side effects such as nausea, vomiting, fatigue, loss of appetite, mouth sores, hair loss, and skin reactions. Potential long-term risks include infertility (the inability to produce children), cataracts , secondary (new) cancers, and damage to the liver, kidneys, lungs, and/or heart. These arise due to the effects of the heavy doses of chemotherapy and radiation therapy received before transplantation. With allogeneic transplants, graft-versus-host disease (GVHD) sometimes develops when white blood cells from the donor (the graft) identify cells in the patient’s body (the host) as foreign and attack them. The most commonly damaged organs are the skin, liver, and intestines. This complication can develop within a few weeks of the transplant (acute GVHD) or much later (chronic GVHD). To prevent this complication, the patient may receive medications that suppress the immune system. The presence of massive lymphadenopathy or a large mediastinal mass, a particular feature of patients with T-cell disease, has been associated with a poor prognosis. T-cell ALL may release a cytokine osteoclast-activating factor that results in symptomatic hypercalcemia (elevated levels of calcium in the blood) and diffuse osteopenia (mild decrease in bone mineralization, not as severe as osteoporosis.). Facial palsy due to nerve root infiltration may also be an early sign of T-cell ALL. B-cell ALL has a more rapid growth rate and relapses within 6 months, while B-precursor ALL relapses after considerably longer intervals. The growth rate of T-cell ALL tends to be intermediate between B-precursor and B-cell ALL and the duration of risk of relapse is greater than for B-cell but less than for B-precursor ALL. Although the treatment of childhood ALL has been gradually intensified during the last 30 to 40 years, leading to a significant improvement of outcome, still roughly 25 percent of patients suffer from a relapse of the disease. The management of relapse remains controversial but increasingly involves the use of high-dose chemo/radiotherapy and stem cell infusion. Despite recent improvements the overall results remain unsatisfactory worldwide. Relapsed ALL continues to make a major contribution to the morbidity and mortality of childhood cancer. Survival of children with acute lymphoblastic leukemia (ALL) is often described as the success story for oncology. In the 1996-2204 SEER data the 5-year survival for patients will ALL was 84 percent for children and young adults less than 19 years of age and 88 percent for children and teens less than 15 years of age. This is in comparison to 3 percent reported in the 1960s. The outlook for children and adolescents diagnosed with ALL today is much better than even before. However, as we all know, cure in not assured and is not obtained without sequelae (Note: sequelae means any abnormal condition that follows and is the result of a disease, treatment, or injury. E.g. deafness after treatment with an ototoxic drug, or scar formation after a laceration). Nowadays … childhood ALL can be successfully treated in about 80 percent of patients by the applications of intensive combination chemotherapy regimens, which in specific patient subgroups may need to be supplemented with radiation therapy and /or hematopoietic stem cell transplantation. However, although the goal of developing effective therapy for the majority of children with ALL has been achieved, significant numbers of patients still die due to recurrent disease or the toxicity of treatment applied. Muller J et al. (Treatment results with ALL-BFM-95 protocol in children with acute lymphoblastic leukemia in Hungary. Article in Hungarian: Orv Hetil. 2005 Jan 9;146(2):75-80) reported that the treatment outcome of Hungarian children with acute lymphoblastic leukemia improved remarkably over the last decades. Seventy-eight percent of children suffering from ALL could be cured with the ALL-BFM-95 protocol. Kocak et al. (ALL-BFM 95 treatment in Turkish children with acute lymphoblastic leukemia-experience of a single center, Pediatr Hematol Oncol. 2012 Mar;29(2):130-40) reported that their 13 years’ experience treating 140 Turkish children with ALL with original ALL-BFM (Berlin-Franfurt-Münster) 95 protocol. Complete remission rate was 97.7% with a relapse rate of 12.9% and death rate 17.9% during a median follow-up of 69 months. The event-free survival (EFS), disease-free survival (DFS), and overall survival (OS) in these patients at 12 years were 75.0%, 87.1%, and 80.6%, respectively. In the article, Hope for children with leukemia (http://sg.theasianparent.com/hope-for-children-with-leukemia/#), Eeleen Lee reported on the experiences of childhood leukemia treatment in Singapore. It is a highly curable disease with intensive chemotherapy. The current cure rates in the developed world surpass 80%. One of the significant side effects of the treatment is damage to organs like the heart, skin and brain, which may lead to long-term complications, including secondary cancers. In fact, the costs related to treating the side effects of chemotherapy often exceed those of treating leukemia. The increased complications put the young patients at a high risk of long-term side effects, which can be life threatening and significantly reduce quality of life. One hope for the future is that the therapy of the acute leukaemias in children should be more globally available to children. Probably not more than 20 percent of the children on this planet with leukaemias are offered a therapy that gives any chance of cure. Modern, high-intensity protocols are expensive and carry a high risk of morbidity and even mortality. Therapy-related death or complications are of great concern, between 3 and 5 percent die from therapy-related complications. Long-term late effects are also of increasing concern, especially when it comes to the commonly used anthracyclines and the development of heart failure. Clearly, the risk of heart failure is very significant in children. (Note; Examples of anthracyclines are Andriamycin, Doxorubicin, Epirubicin, Indarubicin, Mitoxoanthrone). Treatment of childhood leukemia represents the most outstanding achievement of oncology. In spite of such success story, still 30 percent of patients die – either of the disease or from the treatment itself. Other cancers such as sarcomas, ovarian cancer, breast cancer, small cell lung cancer, myeloma, follicular lymphoma are described low cure rate cancers. What do you think of the chance of success then? Do you ever wonder why, Allen Rose, worldwide vice-president of Glaxo-SmithKline said (Daily Express, 8 Dec. 2003): Drugs for cancer are only effective in 25 percent of the patients? Perhaps that is the most and the best that chemo-drugs can do for most of our common cancers! Treatment of Leukemia is not cheap and comes with drastic side effects. And according to Professor Yeoh (above), the costs related to treating the side effects of chemotherapy often exceed those of treating leukemia. Do you wonder if that is all scientific medical science can offer this world? Has anyone ever attempted to find a better and effective alternative? No, that cannot happen because that will threaten the status quo. An excellent article on Childhood Leukemia was written by Theodore Zipt et al (in Chapter 81: Clinical Oncology, 2nd Ed. Harcout Publishers, 2000). H-733 was a 65-year-old lady. She came to see us on 6 November 2011. She had leukemia and was treated in the hospital in Sungai Petani, Kedah for eight days. Then she was in a Penang hospital receiving treatment from 3 October 2011 to 4 November 2011. She received one cycle of chemotherapy consisting of seven injections. She was scheduled for four cycles but refused to undergo further chemotherapy. The only thing I could remember of this case was the patient telling me that her days in the hospital undergoing chemo were a real “hell”. In this patient’s file are only two pieces of paper – the Disclaimer and Release of Liability form (signed by her son) and a short note about her case. There was no medical report of any kind. Understandable! She went to the government hospitals and if you are not “persuasive enough” or don’t know “your way” enough they don’t give you your medical reports. Based on the patient’s story, I prescribed herbs for her leukemia. Listen to my conversation with this lady after she took our herbs for a week. In this video conversation it was clear that the patient felt better after taking the herbs for one week. I have told this patient (and many more before her) that, If after you have taken the herbs for two or three weeks and still do not seem to benefit from the herbs – i.e., do not benefit in any way, my advice is: Stop taking the herb. Go and find someone else. Do not waste your precious time. Take note of what she said after taking our herbs for a week, I am happy now. One month in the hospital (doing chemo) was hell but now I am in heaven. Unfortunately we never get to see this patient again after this. Why did she not come back to see us again? Did she think that she was already cured after being well? Or could it be that someone had told her to stop taking our herbs and go for something else “better”? I can’t understand. Definitely it is beyond me to comprehend why! But as far as we are concern, her file was set aside and left forgotten. We know that a majority (70 percent) of patients who came to us were just shopping for a magic bullet. So this case is nothing unusual. Nearly a year later, I received an email from the patient’s son. Let me reproduce the email exchanges we had. Perhaps we all can learn from this episode. The emails from Mr. Chin (that is what he called himself) are reproduced here as they are, without any editing. Patient From Sungai Petani, Her name is Miss Ong. She was my Mother, she pass away this year March. The reason I write this letter to you, Just want to Inform you.. your medicine did not work at all for my Mother Case.. and I hope you can keep this Information for your own record. maybe Next time got the Some cancer patient, you can let them know my mother end result. Maybe 2 week also is a vey important time frame to the other Patient. Thank you Chirs.. Regards, Mr Chin. Reply: Yes…thank you. Is she the one who was in the hospital and she told me that she went through hell in the hospital? How long did you take the herbs? Only for two weeks? …two months or what? I cannot remember the case. Can you give me the file number? Chris. Sorry I don’t have the File number with me anymore, yes My mother does mention she went through hell in hospital. But Chris to be frank, Me as a outsider, my Mother judgement on that time is not right anymore. Penang Hospital do the thing they suppose to do.. So nothing wrong with them. Just that time my mother is in pain and worries, and make such comment, and that time I just want her release her stress, so did not make a correction on that spot… My Mother took your herb for 2 week… Mr Chin. Reply: You mean she only took herbs for 2 weeks … and you expect the herbs to cure her? I now remember, she came once to see me and never come back again. And you expect taking herbs for two weeks you can get a cure? Mr Chris.. In the first Place you mention to us, let my mother try 2 week, If this medicine is not work, then this medicine is not effective to her. please move on and try another remedy… I guess you are too busy till you did not remember your word. The reason i make a afford to write a letter to you, just want to share information to you… and hope this info will benefit to another patient. You will do a Job with Love and Caring , and please don’t fall to the trap of hate and criticism..” May God Bless you” have a strange to care to another cancer patient….Thank you. Mr Chin. Reply: Yes… you are right. I have her file H 733 — your mother is 65 years old ..Ong WK ..is that correct? She had chemo once when she came and it was after 7 injections … she suffered the following side effects…a) rashes b) arms and legs swelling c) fevers on and off and d) skin peeled off. a) Did your mother go for more chemo in the GH? b) Or did she go to someone else for help? c) She died in March 2012 — can you tell me what happened between this time? If she took the herbs for 2 weeks …it means that by December 2011 she has finished taking my herbs …. but you only wrote me this email two days ago — almost one years after this? I wonder why you only write me only now? Why wait for so long? I am not trying to blame you, I am just curious to understand what is going on. Oct 18, 2012 Mr Chris. Below is the answer you wanted..
a) No my Mother just go for 1st round chemo, and GH already said she are not fit to go for 2nd round of Chemo..
c) Her Body condition is getting weak, and putting palette and blood into her body.. also didn’t work for her anymore. c) Chris as i mention to you at the first place, Just share this info so that you can use it for your reference.. I am not here try to Blame anyone…In Fact In this world there is no 100% way can cure cancer. So instead wasting the time condemn people medicine did work and how harmful to people, why not take this precious time study how to solve this cancer problem. But I know this is very Challenging… Thank you! Reply: Thank you very much for replying. It is good for you to reply and complete the story of your mother. I would like to write this story. I have just written a book and the last chapter is called My Patients My Teacher ….. I am sending this copy to you. May be you want to read it. Over 16 years I have helped thousands and thousands of patients …and there is NO cure for any cancer. Everyone should know that. Everyone who has cancer all die. Even without cancer, we all also die. If you have time, it is good if you can answer the question I asked you earlier but understand that no one is trying to blame anybody. We understand that. What I would like to know is this —- your mother only took my herbs for 2 weeks and she died some months later….the question is: Why did you write to tell me about this only NOW … many months after she died or almost one year after coming to see me once? Why not write earlier? I may have helped better. What about the Chinese doctor — he also cannot help her? How long did she take herbs from the Chinese doctor? Did you also write to the Chinese doctor and tell him that your mother died? It would be good if you give your answers so that we all can understand the real story. And I also can write a good story about this so that all patients understand what is going on. Thank you again for writing me. Chris. Thank you for Sharing Your Book… hope this book will be benefit for the cancer patients and theirs family. Chris Hope You can understand , with Lose a family member is not a easy thing… and we need time to calm down ourself and get refresh to think what we suppose to do , to help another cancer victim.. If the Chinese Doctor can help, My mother will not be died…My mother take 2 month for this chinese doctor herb… Yup I do wrote the letter to this chinese doctor, The answer from them is simple. thanks For Sharing, They will keep my mother as their study record. and thanks me for Informing them. Chris i Just hope you just can share my mother Case to another AML Cancer Patient, Your Medicine is not work For AML Patient Before and at least let them aware about it. If They Still want to try your method then is their choice….and I also think maybe for some Patient 2 week try period also is a very important time frame for them.. I believe some Patient Family did not report the result to you, and make you can not judge your method is workable for which type of cancer..
1. Did your mother go to China for treatment? 2. How long was your mother on this Chinese treatment? … also 2 weeks like mine? 3. Is she on any treatment when she died? Was she on the Chinese treatment or no treatment at all. When I share this story, I need to have as much information as possible, otherwise I cannot understand and explain why. 1. Did your mother go to China for treatment? No her Condition is not fit to fly over there, and the Chinese doctor also mention no need her to go over there because of my mother condition. 3. Is she on any treatment when she died? Was she on the Chinese treatment or no treatment at all. No treatment at all when she died.. Reply: You are right …don’t waste time on medicine that do not work …you tried the chemo … it did not work, you came to CA Care and took my herbs for 2 weeks and it did not work…then you tried 2 months of herbs from Chinese hospital in Shandong and it did not work … so where do you think you can find medicine that can work? Do you think that DC-CIK you mentioned can work? If so, how do you know that it will work? … my patient had this treatment in Singapore and then went to Japan for the same treatment and for many months …to do this treatment and he died. It did not work either. You can see they all need help…BUT who can cure leukemia????? Have you read anything about leukemia? When I write your mother’s story, I shall explain that there is no one on earth who can cure leukemia. 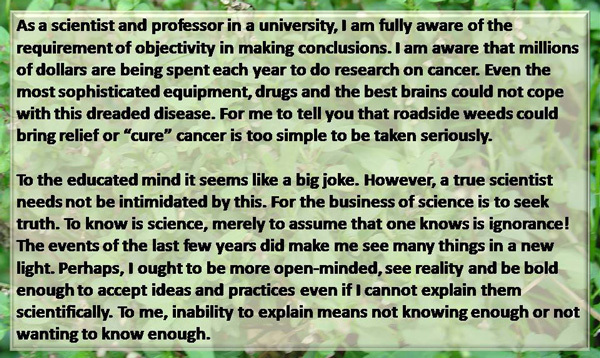 If and when you think you know where to find cure for cancer, please let me know. I too want to know. And if you read the chapter of the book that I sent you…. I tell everyone who come to see me … there is no cure for cancer ….I have no magic bullet for cancer….that is why I tell you…take my herbs for 2 weeks and go elsewhere if you don’t think it helps you… simple as that. It is good that you write me. I shall write some articles to let patients know more about cancer. It is not an easy problem. Chris. Chris I know your frustration… Seeing people In front of you who’s seek for help and you can not do anything about it. Maybe Is good too, let me Paint my picture more clearly… as a Patient of the Family who do hope too Reduce the ” NOISE” during company our family member for the last journey… ” NOISE” mean’s the fault hope.. the hope that think this cancer can be fix, the hope thats make us didn’t prepare our family member will be gone. I think if we were know this cancer can not be cure at all in the first place , then we will do a necessary preparation for it. so please pardon me if i said it unclear…I believe my mother just a single small dot in your journey to help the cancer patient.. so with my mother result I telling you, maybe you can use it as a data. within of how many Leukemia person who come to seek for your help.. is benefit it form your medicine…and you can come out a percentage chart of a effectiveness of your herb toward Leukemia. If the answer is only 1% then, you can tell the patient are they welling to try it or not, But If 0% then I guess you can cloose down your herb section for Leukimia.. This Happen Is GH Penang too , Doctor Goh do mention to us, with my mother condition, the 2nd Chemo will have a 15% success rate only. She Ask us to think cafully… so we decide not to go for it.. In my First Letter to you I already wrote in this world still don’t have a 100% effective way to cure the cancer.. we all know that…Chin. Reply: Thank you for your reply. After reading and replying to your emails, I think I need to send you the complete book that I wrote free-of-charge: Cancer – Is there another option. Take it, read it and try to understand it. It is definitely too late to save your mother, but perhaps it may be able to help others. That is if read and understand it. Let me tell what you need to know that may help you in the future. 1. In the first two pages of the book, I talk about ignorance. Over the past many years, many (thousands!) cancer patients had come to seek our help and advice. They wanted to know what else they could do, generally after modern medicine had failed them. Most of these patients were totally ignorant of what they were up against. Many think that they could easily find a cure for their cancers. They come seeking for that non-existent magic bullet for their cancer. Alas! Many failed to find a cure. At CA Care we don’t talk about cure, because we do not see a cure for any cancer. In cancer, it is worth noting that ignorance kills. To be able to find healing, patients should realise that they must do something for themselves, not to rely entirely on others to help them. 2. You are right – your mother is just a single small dot in your journey to help the cancer patient. Yes, your mother died but it does not mean that other patients should follow her to the graves as well. 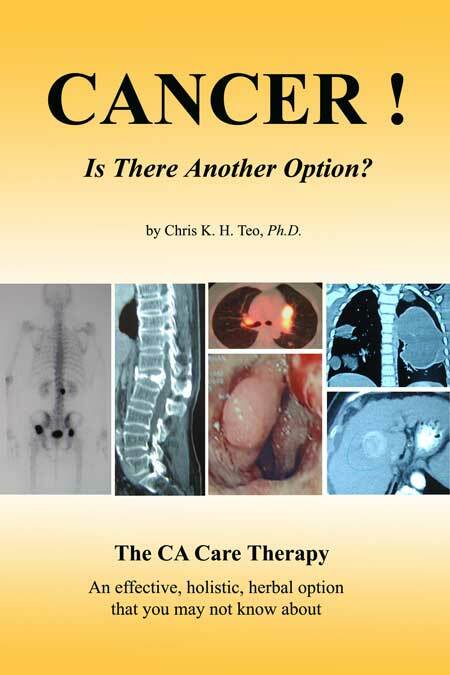 Read Chapter 7 of my book: Chronic Leukemia: Blood Improved While On CA Care’s Herbs. This lady works in the Hospital in Hong Kong and she has been taking my herbs for two years (not two weeks like your mother) and she is doing fine. This is the story of Pak Jam’s wife (teacher) who had leukemia and was in worse condition than your mother. But she survived and could go back to resume teaching again. She came to see me beginning of this year (2012). And she was taking herbs for more than 2 years, not two weeks like your mother. Then you want to know what? She died after she came to Penang (in 2012) – because she went to the hospital in Aceh and they put in the wrong blood for her! One lesson anybody need to learn is that you may give the same medicine but patients are different. If the medicine fails it is not because the medicine is not good – it may be the patients are not good. Human beings are not the same. They carry different baggages. After helping thousands of patients over the years, I have learned that almost 70 percent of them are here to find a magic bullet or wanting to find cure on their own terms. Our therapy is not easy to follow. You need to heal yourself – and it is you and you alone who can heal you. Others can only help but you decide you own fate. No two persons taking the same path would end up at exactly the same destination. Cancer is about you as a person. If you are not able to change your mental attitude, your diet, your lifestyle, etc. no one else can help you. You are a goner if you come and tell me: If I cannot eat meat life is not worth living; I have no time to cook the herbs; The herbs taste awful, etc. One thing we all must do is to accept reality. If the cancer is already serious, there is nothing in this world that can cure it. Read Chapter 12 of my book: Mayo Clinic Gave Him Only One More Week to Live. The Doctor Is Not Convinced That Chemo Can Kill the Cancer This Time. Do you know what Mayo Clinic is? This is one of the best hospitals in the world. Kings and rich men all over the world go there for treatment. Yes, after Mayo this young man wrote asking me to help his father. Let us face reality! I understand – he wanted to do the best for his father. Like you wanted to do the best for your mother – and you thought buying herbs from China can cure your mother. Read also Chapter 13: Salivary Gland (Parotid) Cancer: The Doctor Said: It Would Be Useless to Keep Him Alive. Do you know that the wife of this patient is a dental specialist? She is medically trained. She too could not find a cure. She too wanted to do the best for her husband. But there is a limit to what anybody can do to help. The same is true for you. Your mother went to the hospital and had chemo. When she came to me she was suffering side effects like rashes, swelling of legs and arm, she had fevers and her skin peeled. It was lucky that she did not die of the chemo. She was on my herbs for two weeks and then went for herbs from a hospital in China for two months. And you expect a cure for her leukemia when even the doctor in GH had told you the second round of chemo will only give you 15% success rate only. And you did not think 15% was good enough. What you don’t understand is success rate — success rate does NOT equal to cure. What is success rate? Nothing – it is not cure. I jokingly tell patients – CA Care is your last one stop. The cases that come to us are usually beyond us to cure. Make no mistake, we are under no illusion. Over the years we always call a spade a spade and we face reality without any pretence. Death is a reality – it can happen to you or me, anytime – irrespective of whether you have cancer or not. Perhaps with cancer, the journey to the grave seems more certain and somewhat shorter! Okay, with this, I think I have written enough. I thank you again for writing. I would like to end this discussion and let me move on to help others who need my help. I hope you have time to read this book that I send you. Take your time to read and understand. It may help you or others one day. Chris. Really appreciate your thoughtful and meaningful write back..Chris Please don’t miss understanding I am here judging what are you doing….In fact I don’t have a right and qualified to do this at all.I just hope I can provide my mother result as a data, so that maybe you can use it in the future..My mother AML Cancer is just a single case of so many different type of cancer. Me, by hoping provide you this info, you roughly may know your herb is more effective to which type of cancer…Lastly You mention to us just let my mother try 2 week your herb. but that time if you were tell us to try 2 years ( like a Hong kong Ladies) and follow your diet guide…then we will follow you…. That time is not we want to give up, we done that because you tell us 2 week is the limit. Chris Really Thank you for Your Time ,and I think I took too much time from you.Please move on with GOD faith.. and continued your meaningful journey. ” God Bless You” Chris… Chin. Comments: I have asked myself – why do I have to waste time replying to such emails? Let me tell you why. I realize that it is not only the sick person who needs help. At times, the caregivers and family members or even friends too need help. If you view it from this perspective, it makes sense. The message that Mr. Chin wants you to know is this: Coming to see us and taking our herbs for two weeks did not cure her mother of her leukemia. I fully agree with him. In fact I want to add a bit more to this message. If you come to us hoping to find an instant magic bullet for your cancer, then I am telling you plain and clear – you have come to the wrong place. Perhaps you have better luck going somewhere else. Go and find someone else who can promise to cure you. Some weeks ago, one lady came to see me. She had cervical cancer. After surgery, she took Sabah Snake grass every day. A year later, her cancer came back. She came to seek our help. I told her to go for chemo but she refused. She told me she understood the serious risk that she was taking in wanting me to help her with our herbs. She did not come to see me hoping to find a cure! I was impressed by her attitude and plan to write a full story of this case. Then there is another case of a man from Jakarta, Indonesia. He had pancreatic cancer. I told him I am not able to cure his cancer. He told me he understood that very well and he wanted me to help him as best as I can. He knew that nobody can cure his cancer. I plan to write his story too. Do you see that Mr. Chin’s case came at an “appropriate” time indeed? Mr. Chin’s case adds another perspective to my two other stories. Here, Mr. Chin came to CA Care expecting to find a cure. And my herbs cannot cure his mother’s leukemia within two weeks. Let me end this article by quoting my favourite author, Harold Kushner, a Jewish rabbi. This what he said, When all you’ve ever wanted isn’t enough. This is what he wrote,… the irony of the phase “the best and the brightest”… The best and the brightest was the way we described the government officials who got us into Vietnam to begin with then kept getting in deeper and deeper. They were undeniably brilliant men, honor graduates of the finest universities, armed with mountains of information from the most sophisticated computers, and still they kept making the wrong decision. They had intelligence. They had information. But they lacked wisdom… smart enough to lead, but not wise enough to know where they should be going. It there is one lesson which I think you can learn regarding this case. Use your common sense (or be wise!) when gathering information – especially from the internet. They are a lot of “junk” information in the cyberspace. We can find all kinds of claims – this and that stuff can cure cancer. Evaluate these claims critically. Mr. Chin’s mother underwent chemo for about a month. This did not work. After one cycle she gave it up. She came to CA Care and took our herbs for two week and decided that our herbs did not cure her. The son “hunted” for more herbs – this time from China and his mother took them for two months. It did not cure her either. Mr. Chin was in the midst of wanting to “send her to try the DC-CIK treatment” – also in China. But it was too late – his mother died! How long can you go on trying – hopping from one treatment to another? Leukemia does not wait for anyone. You don’t have the luxury of experimenting anymore when you have cancer. What many of us fail to realize is that healing starts from our own self first! The real good doctor who can heal us resides within us. Let me quote Kushner again, indeed many of us believe are smart but only … smart enough to lead, but not wise enough to know where they should be going. I told her that she might as well take holy water from her church if she declined chemo and Dr. Chris herbs. Then I gave Sabah Snake Grass for 2 weeks and nothing happens but her stomach kept growing every week at the rate like a pregnant woman baby growing per month. She blamed me and the Sabah Snake Grass but told her I only administrate it after her bloating stomach. Sometime in August 2010, I received an e-mail from a lady from a neighboring country. She works in the radiology department of a hospital. That means her work involves taking X-rays, CT scans, etc., for patients. She was down with chronic lymphocytic leukemia (CLL, suspected). She declined medical intervention and decided to seek our help. In fact, she is not the only person who wrote us. Two others in the same department of the same hospital are also CA Care’s patients. They were also diagnosed with cancer and they too took our herbs. This lady with leukemia has been faithfully taking our herbs: Capsule A, Leuk 3, Leuk 4 and LL-tea since August 2010 until now. 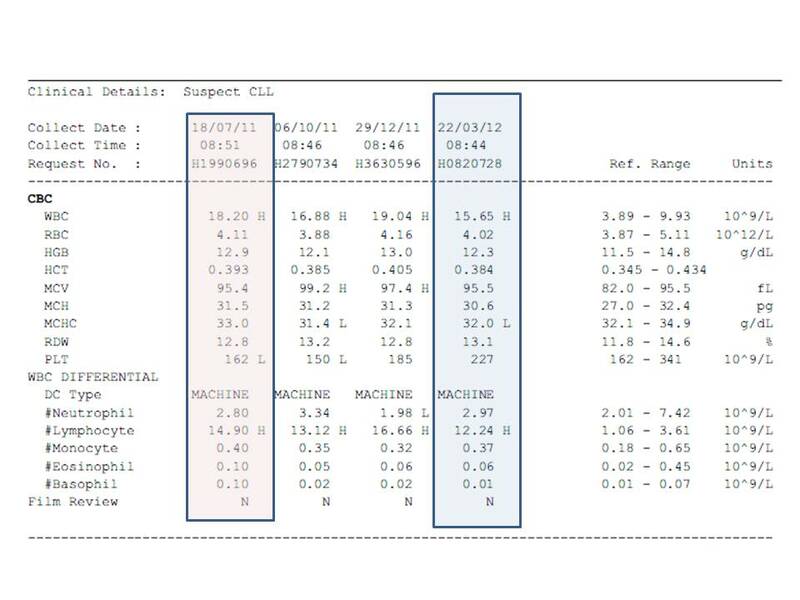 Attached is my blood test result on 22 March 2012 for your reference. Thank you very much for your help. Regards. Reply: Thanks for sending me the blood results. Wonderful ! What did the doctor say? Also besides taking my herbs, did you take any other medications? How do you feel? Chris. My doctor does not know why I can improve as he did not give me any medication. I told him yesterday that I receive your herbal treatment. His response is just asks what types of herbs I take. I only take the Herbs you give me and follow the no animal meat diet. I also inhale oxygen few times a week for 10-15 minutes, if I have time. Starting from middle of February, I have influenza and upper respiratory infections and took medications including antibiotics few times for these but stop a week ago before my blood test. However my flu is not completely recovered until now. Anyway, everything is quite OK apart from the flu. Thank you very much for your help again. I will continue to keep the treatment and diet.